World War 2 was a theater of great horror and terror, but it was also home to many a story of courage, strength, bravery and ingenuity. While we can easily look at who was in the right and who was in the wrong today, in the thick of the war, each side was convinced that they were in the right. The Nazi’s and German soldiers fought for a cause they believed in, they fought for their country, for their family, even for their faith. When the terrible truth about the Holocaust emerged, and was thrown in front of those who had no idea of such things, they wept and trembled at what they had seen. German civilians, after the war, were forced to march through concentration camps and see what horrors had been committed by the government. A great many recoiled in terror. But just because a side might be morally wrong, it doesn’t mean that they are excluded from having heroes and brave men. Some might even be noble. Today we are going to look at the life of one of the most noble generals to ever serve the German Army during World War 2: Erwin Rommel. Erwin Rommel was born in 1891 on November 5th. His father was in the German artillery division and his mother was a schoolteacher. Erwin decided to follow after his father and attended at a military school where he would graduate as a lieutenant at the age of 18. From that point on, his service in the military was marked by war, starting with the first world war. Rommel was a sharp man and a strong leader. He didn’t particularly worry about following exact orders during the first war and because of it, his initiative would often lead him to pull off surprising victories and overtake his enemies using his quick wit and ability to determine the best course of action. He focused heavily on tactics in order to win a fight, using speed and surprise to his advantage each time. This made him somewhat different from many of the other military leaders at the time, who more or less tried to utilize brute force in order to win conflicts. Rommel rapidly moved up in ranks, going from a platoon leader to becoming a first lieutenant, later on becoming a captain. Perhaps one of the most famous exploits during the first world war was when Rommel led his own mountain battalion to strike against the Italian forces who were positioned various mountain ranges. Rommel’s forces were about 150 men and with those forces, he was able to capture 9,000 enemy soldiers. Such a feat was incredible and came about when Rommel decided the best way to fight against the Italian infantry wasn’t a direct assault, but rather would be through moving in the woods to reach them. Rather than give into the urge to take shots whenever they could, Rommel ordered his men to hold fire and not give away their position as they moved indirectly toward the heavy concentration of Italian soldiers. Each time, Rommel’s forces would arrive using the terrain to outflank the Italians, causing them to surrender without much of a fight. Rommel would repeat this tactic until eventually they had seized the necessary territory and had captured the entire enemy force in that area. He did this by using tactics instead of brute force. This would be a precursor to Rommel’s time in World War 2, as his ability to strategize and focus made him a brilliant opponent to deal with. In the second World War, Rommel was a major general and led his men on the frontlines. 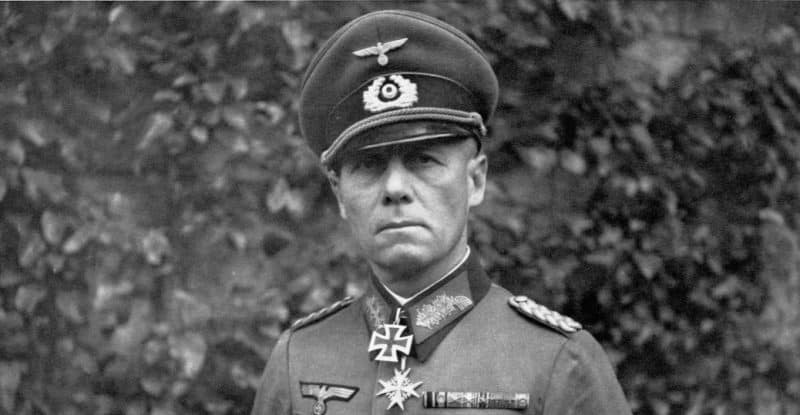 Indeed, Rommel’s picture of being a good leader meant being as close to the action as possible and he was often directing battles on the frontlines, despite the obvious dangers that this would cause for him. He believed in discipline and strength, but more than anything, he believed that a commander must be an example in all things to his men and so he would push himself physically to have the strongest body and discipline necessary to inspire his people. The majority of Rommel’s operations in World War 2 took place in Africa, where he fought alongside the Italians in the newly formed Afrika Korps. Fighting in the desert was a new experience for Rommel but he took to it rather quickly and built a doctrine of mobility that allowed for his forces to rapidly move against their enemy. Rommel’s offensives were relatively successful against the Allies due to his fast-moving plans and his intense drive. The relationship between Rommel and High Command was troublesome for a wide variety of reasons. One such reason was that Rommel did not get along very well with his peers, instead focusing on merit as opposed to rank. He didn’t have professional consideration for them and while he rewarded his own men for their hard work and vouched for them on a promotional level, those from outside of his unit were more or less ignored. The fact was that the German Military itself was very much a special club for those who were in the higher echelons in command. They would often do favors for one another and there was a great deal of special treatment, but not with Rommel. He gave little consideration outside of merit and this would often put him at odds with those who wanted that special treatment. Not only did Rommel have a complicated relationship with other commanders, he also had trouble following orders. His quick moving unit and desire for autonomy often led him to ignore orders from his superiors or even act in spite of them telling him to stop. Sometimes it would lead to success, other times it wouldn’t go as well. He resented being micromanaged and even in his dealings with Hitler, there was a great degree of back and forth between them. Erwin’s role as a German general is a complicated one. On one half of the equation, he never had any kind of direct dealing with the Holocaust, he did not commit any acts of hate against the Jewish people nor did he follow orders for the Final Solution. One the other half, however, he was fighting for the German people which included the Nazi Party. Rommel wasn’t a member of the Nazi’s and he despised when propaganda tried to prop him up as a Nazi supporter or member of the party. He had a personal relationship with Hitler, but as the war continued, tension between them grew as well. Rommel was considered to be a good person by his enemies and his activities never indicated that he was responsible for any kind of serious atrocity or war crime, at least not ordered by him directly. Like with any war, there were questions as to some of his conduct, but for the most part, he stands apart from the viciousness of the members of the SS and the Nazi party at large. As the war continued, Rommel was watching his nation crumble apart. Hitler’s orders were continuously growing more irrational and as a military tactician, Rommel could easily see that his nation had very little hope. Despite his own ability to move his forces and position them to strike against the encroaching Allied forces, there was nothing that he could do to win the war. With Hitler in command and growing more unstable by the day, it was over for Germany. Rommel was a patriot more than anything, he loved his country deeply. He knew that Hitler’s influence over Germany was committing it to a great level of destruction. At the same time, Rommel’s views on the actions of the Nazi Party and those in German High Command was one of contempt for he knew the crimes they were committing and he spoke greatly about a desire for justice. Hitler himself became a target for Rommel’s frustrations with criminality and near the end of the war, Rommel had come to believe that Hitler was a problem that needed to be stopped at all costs. Eventually, he would find an opportunity to assist in deposing Hitler, as he was invited to take part in the July 20th Plot. While those who were conspiring against Hitler wanted to murder the man, Rommel believed that it would be more reasonable to simply have him arrested and answer for his crimes. These beliefs weren’t shared by the rest of the conspirators, as Hitler’s influence on the people was far too deeply rooted for him to face any kind of trial. Rommel argued that Hitler’s death would make him a martyr to the cause. As deliberation and focus on a major plan to overthrow Hitler was underway, there was a problem. Rommel was seriously injured in an airstrike, and that forced him to spend some time recovering. During his recovery period, he was unable to take part in any kind of plot. Without his support, the plan didn’t go as well and the July 20th plot failed miserably. Many who were involved with the attempt on Hitler’s life were arrested and it was only a matter of time before Rommel’s name came up. To the German Government, this was a very big problem. Erwin Rommel had quickly become one of the most important people in the military and Hitler’s favorable relationship with the man had given the propaganda machine the perfect poster boy for the war effort. Rommel was a national hero and everyone loved him. A lot of energy had been invested in the man, but now it was found that he was a traitor to the German state. This would be a PR disaster for the Germans, a man who once loved Germany turning his back against the Fuhrer? Hitler was none too pleased with the prospects. And so, an arrangement was made. It was a terrible situation and one that no man would ever want to be involved with. They approached Rommel and told him of the situation. They knew that Erwin had conspired to kill Hitler and they had a few options. They could bring Rommel up on charges of High Treason, take him to court and indicted his entire family (wife and son included) which would no doubt lead to the execution of his loved ones and him dying a traitor instead of a hero. Or, Rommel could voluntarily take poison and die as a hero to the nation, leaving his family safe and sound. No one would know the real story and Rommel would keep his legacy safe. Erwin had very little choice. Sitting in his home with his sons, he was forced to make a hard decision. While his son protested the choice and desired instead to fight their way out, Rommel wasn’t a fool. He knew that Hitler’s forces would storm the home and kill everyone inside if Rommel refused to go with them. So, he told his family of his decision, said his goodbyes and agreed to leave with the SS. He wore his military uniform and carried his commander’s baton underarm as he climbed into the car with the men who were under instructions to see him dead. While in the car, he was given a cyanide capsule and he consumed it, dying a few minutes later. He had lived a life fighting for his people and when it came down to the end, he knew that he had to make the best decision for his family. Hitler and his forces covered up the whole affair, claiming that Rommel had died due to his various injuries that he had sustained during the war and the Desert Fox was laid to rest with full military honors. It wouldn’t be until after the war that his death was discovered to have been ordered by Adolph Hitler. The question is often asked, was Rommel a good guy or a bad guy? The reality is that with war, it is never as straight forward. The man believed in justice and merit, but fought for a side that was actively murdering millions of innocents. His own conduct was relatively clean, but does that justify who he was serving? Did he even know of the horrors that the Germans were committing? Such things are hard to tell, as revisionist history has worked hard to scrub Rommel’s story clean, for after the war, there were really no heroes left for the German people. The image of Rommel being the good guy serving the wrong side was expertly crafted in order to give the German’s someone to model after. Good or bad, we should learn from this story that in any side, there are universal principles that are to be respected no matter what. Bravery, honor, justice. These were the things that Rommel brought to the table and for that, he should be respected to the highest degree.